Direct holding of competitions shall Main judiciary board approved by the Board of International Draughts Federation. All sportsmen’s, regardless of gender, age and rating can participate in the competition. Competitions are held in accordance with the Official Rules of the game and competitions in draughts-64. The system of holding and time control at every stage is set of the panel of referees. Norms of international titles are set in competitions. Place in the competition at each stage are determined by the highest total of points scored by the participants. For the victory is given — 2 points for a draw — one for loss — 0. At the final stage (in the final of World Cup) coefficient of 1.5 for of Scoring is introduced. In the overall World Cup standings are taken into account four of the best results shown in stages and half of the result (points) shown in the fifth stage. In case of a tie among two or more participants, place of participants in the overall standings of World Cup are determined by the highest place in the classical program of one from the stages in which they participated. In case of equality — by the highest place in another stage, etc. 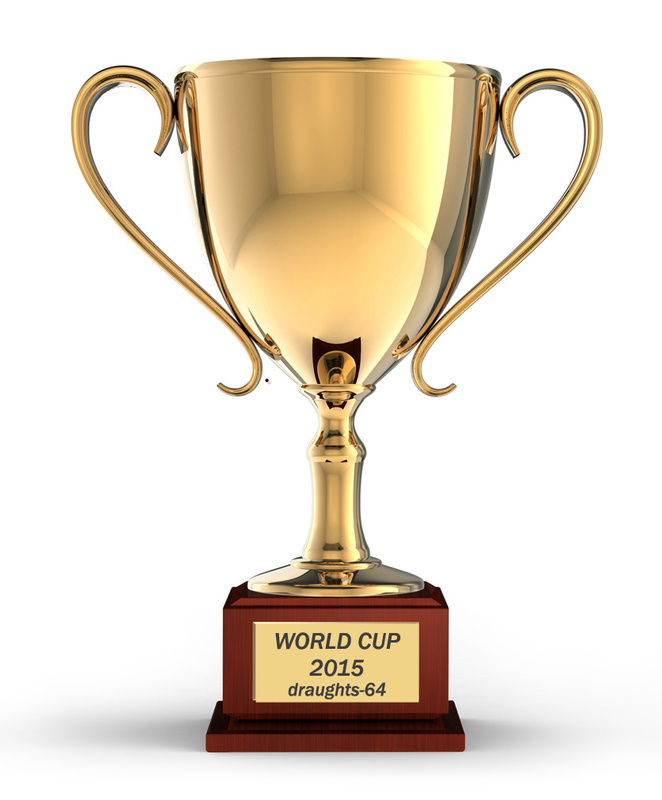 World Cup winner is awarded the title of «Winner of the World Cup 2015 in draughts-64». The winner in the World Cup among women is awarded the title of «Winner of the World Cup 2015 in draughts-64 among women.» She is awarded the trophy and diploma. Participants, who took second and third place among women, are awarded with diplomas. The winner in the World Cup among juniors 1996 and younger is awarded the title of «Winner of the World Cup 2015 in draughts-64 among juniors 1996 and younger.» He is awarded the trophy and diploma. Participants, who took second and third place among juniors 1996 and younger, are awarded with diplomas. The winner in the overall standing of World Cup 2015, winners of World Cup among women and juniors can be recognized players, who participated in the classical program at least of 3 stages. Best Veteran 60 + – 100 EUR (who participated in the classical program at least of 2 stages). Participants are required to be present at opening and closing ceremony with a dress code (suit and light shirt for men, dress or pantsuit for women). In case of violation of this paragraph they are deprive of official awards. Prize-winners of the World Cup in 2015 are allowed to participate in the European Championship in 2016. The winner of the World Cup 2015 will be provided with accommodation and meals by the organizers of European Championship. He will pay tournament fee in a single amount. Another prize-winners will participate in the European Championship in 2016 without a tournament fee. — The costs of the awards in the Overall World Cup (Cup, medals, diplomas, prize money) — at the expenses of International Draughts Federation.